Krotona Braille Institute. Founded in 1910 in Boston, the Theosophical Book Association for the Blind moved to Hollywood in 1917, where it became the Krotona Braille Institute. 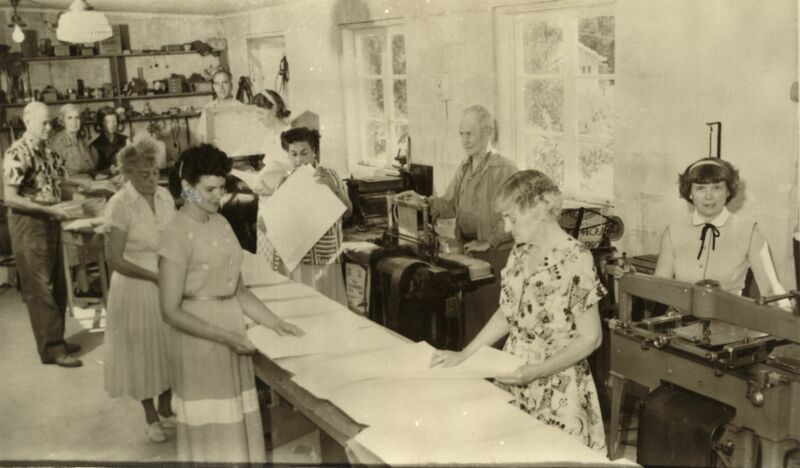 Roy and Flavia Snyder (seen operating the Braille presses on the right) moved the Krotona Braille Institute to Ojai in 1947. The Institute consisted of a Braille publishing house and the Baker Memorial Library, which loaned Braille books throughout the world. The above is an excerpt from Ojai: A Postcard History, by Richard Hoye, Tom Moore, Craig Walker, and available at Ojai Valley Museum or at Amazon.com.